Unfortunately foundation is not a one-size-fits-all kind of product. To make sure you find the right one for your skin type let us help you. Try a powder foundation if your skin tends to look oily during the day. If your skin looks dry and cakey after a while you are best to wear a liquid foundation that gives a dewy finish. Luxuria Cosmetics Mineral Loose Foundation Powder is best for oily skin and dry skin is best served with our Anti-Aging Foundation. If you find that your foundation coverage looks smooth and even when you apply it, but that it looks a patchy mess in no time, we can help too. The problem might be that you are applying your foundation in lighting that is too dark. Try to find the room with the brightest light and apply your makeup there. You will have more control over your foundation and it will be easier to blend. 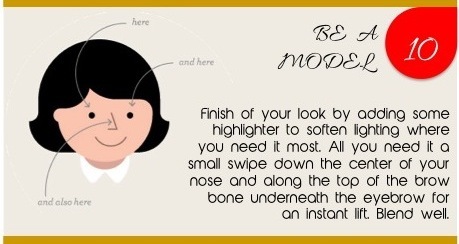 This way you will avoid that pesky foundation look that ends at your jawline. Try to use primer or finishing powder. These products with make your skin hold on to your makeup longer and keep your skin hydrated. A moisturizing primer can do it all. Primer is best applied straight after cleansing in the morning. Luxuria Finishing Powder can finish off your makeup look. Are there different eye shadow tips for different eye shapes? Yes. Eyes come in all different shapes and the way we apply shadow to our eyes differ from shape to shape. Let us give you some good makeup advice in the form of 7 eye shadow tips for different eye shapes. Eyes narrower than one eye width are regarded as close set. However it is not hard to make close set eyes look wider. The trick is to use a light color on the inner corners of your eyes and extend the outer corners using dark colors. You can also widen your eyes by lining only the outer corners with eyeliner or mascara. With deep set eyes only a small portion of the eyelid is visible because the eyes sit deeper into the eye socket. To off-set deep eyes try using a lighter shade of color on the visible, mobile eyelid and a darker shade on and just above the socket line and crease. Blend it up and out. With this eye shape the outer corners of your eyes turn down. The focus should be to shade up and out. Apply liner close to the upper lash line and blend shadow along the socket line in the outer twothird of the eyes. You can also help lift your eyes by using liner close to the upper lash line and curling lashes before applying mascara. If a fold of skin hangs over the socket line then you have hooded eyes. This tends to happen with age. Try to use matte shades in medium to dark and keep your eye makeup simple. Avoid shimmery colors. This eye shape has a buldge from the sock to the lash and can be hard to work with. The best way to shade this eye and conceal the budging eye shape is to use medium to dark matte colors on the lids. Lighter colors will draw more attention the lid. Round eyes tend to be large and open. You might want to elongate your eyes. Apply a medium eye shadow color on the lid to the crease. Allow the eye shadow to come up towards the brow in the outer corner of the eye and then down to the lower eye lid. Any eye technique will work on almond eyes. It is considered to have the perfect proportions. Use any of the above eye shadow tips. 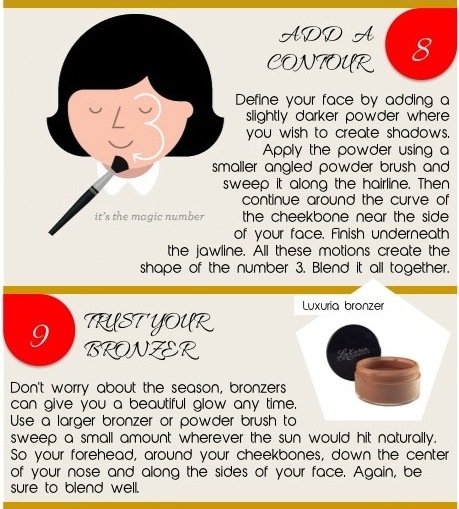 Let us know how these tips helped your look and if you have any tips of your own please share them. Facebook, Twitter or Instagram. With a great new fashion season before us we also see an exciting new season in beauty. 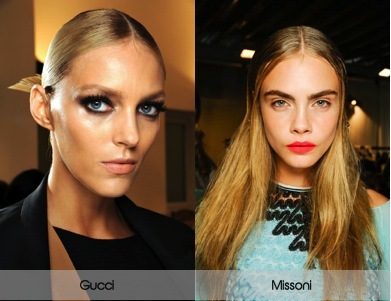 Which makeup will we wear in the spring of 2013 and how do we do our hair? Are we trendy with bright red lipstick and what about the wetlook hairdo? In short, what are the trends? 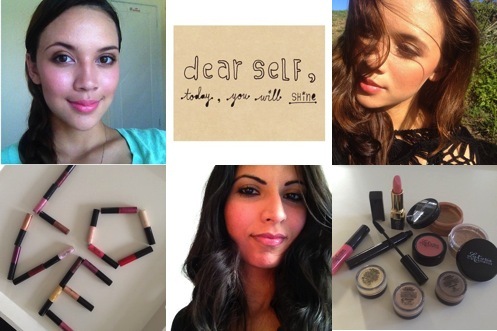 To give you a hand we have put the finest spring/summer 2013 beauty trends on a row. 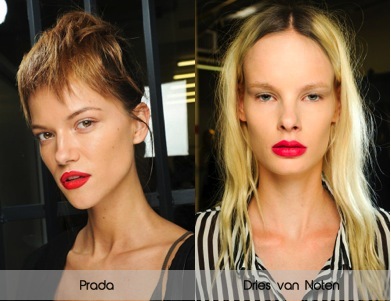 Bright, matte lips play a leading role in the face by Missoni, Prada, Rochas and Burberry. Besides popping red lips, the rest of the face stays natural. No mascara or eyeliner, just an extra ‘light spot’ in the corner. If the emphasis is not on the lips, then it is on the eyes. The smokey eye is still top of the list. But Chanel, Christian Dior and Versace style. Metallic blue or silver eye shadow over the entire eyelid. The complete 60s makeup look we found at Marc Jacobs. Complete with colored eyebrows, a black bow on the eyelid and lots of eyeliner. The lower lashes are important in this look and get an extra layer of mascara. 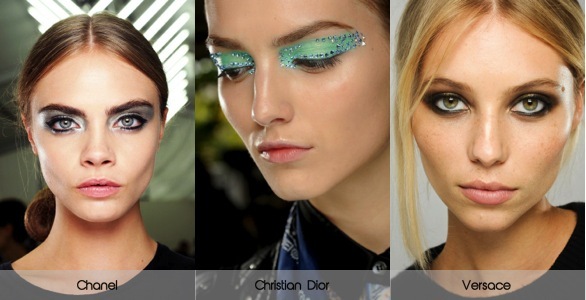 Also Moschino, Louis Vuitton and Moncler showed a sixties makeup look. 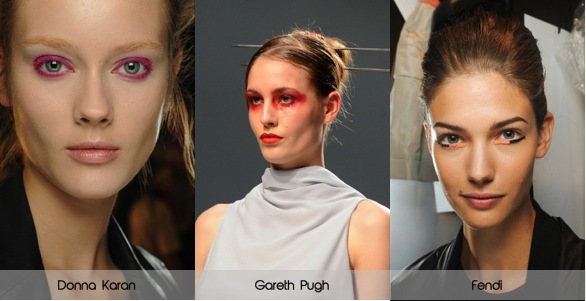 We did not only see the color pink in clothes all over the catwalks, but the eyes were not forgotten. Donna Karan, Gareth Pugh, Fendi and Tommy Hilfiger graced the eyes with at least partial red or pink color. Not just eye shadow, but we also saw mascara in bright fuchsia. Full, feminine and long lashes are an inspiration from the 90s. The lashes at Giorgio Armani are thick and long, long and spread out by Gucci and Dolce & Gabbana chose thin and many. Anyway, more is more in this trend. Labels such as Fendi, Donna Karan and Louis Vuitton crave their childhood. Their models went down the catwalk with a hairband on their head. If properly styled (that means avoiding the complete childrens look) it is a nice and easy option for a bad hair day. Although it is something we normally associate with men, women can also leave their house with a wet look hairstyle this spring. And if you do it like Gucci, Missoni, Christopher Kane and Paul Smith you will actually look very good. 2013 marks the return of grunge, but then in the form of hairstyles. Kenzo, Dries van Noten, Trussardi and even Prada and Miu Miu with their feminine collections could not resist the spiky hair. Very useful if you have limited time to get up. Many fashion houses had their models parade with a sixties coupe. What to think of? Hair which is pinned to the back of the head or put in a tail, and lightly teased at the top. 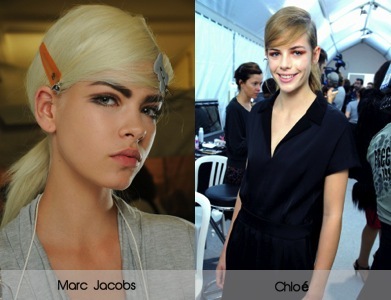 The perfect hairstyle for the spring of 2013 by Marc Jacobs, Oscar de la Renta, Mulberry, Moschino, Chloe and Louis Vuitton. If you thought there was nothing new in separations, you are wrong. There is another possibility and that is the V-separator. 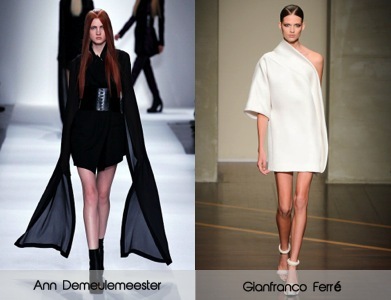 Ann Demeulemeester and Gianfranco Ferre sent their models with this separation onto the catwalk. Haven’t done the red thing yet? In glassy gloss or creamy satin, and in every shade from almost-orange to crimson, the color was major this season. This orange hue may seem retro, but the shiny finish is futuristic. The result? A trendy lip great for day or night. Makeup artist Tom Pecheux created this look at the Moschino spring fashion show by applying a creamy orange lipstick, then layering a clear gloss on top. Who needs injectables? At Prada, makeup artist Pat McGrath exfoliated models’ lips to make them swell up a bit. Next, she lined and filled them in with red pencil, then coated with lipcolor. Final touch: eye crayon traced only along the Cupid’s bow. This Kabuki-inspired shape is a flirty twist on the classic red lip, perfect for some daytime drama. Says makeup artist Charlotte Tilbury. She used a lip pencil to draw an extreme heart-shaped lip line that tapers downward before the corners of the mouth, then filled it in with lipstick. Into compliments? This hot pink lip, spoted at the Dries Van Noten show, should get you plenty. (It’s not for work, though!) To do this look created by makeup artist Peter Philips, first trace lips with a bright pink liner, then use a lip brush to blend a luminous lip color on top. What we love about this wearable color: There’s actually no lipstick. 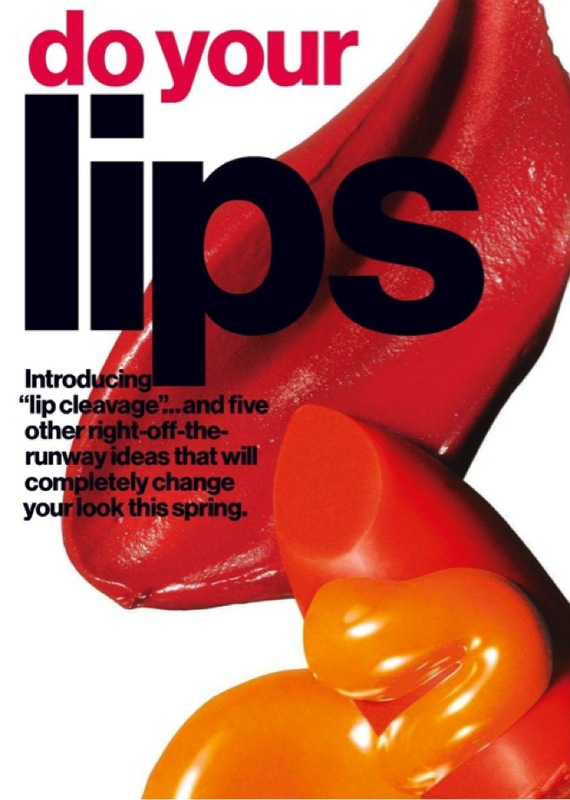 At Jonathan Saunders, makeup artist Lucia Pieroni prepped lips with moisturizing lip balm, which then made it easy to line and fill them in completely with a burgundy lip pencil. Top with a thin coat of clear gloss. Models at Holly Fulton flaunted an old-school 1950s-California look, complete with a neon lip. Makeup artist Andrew Gallimore defined the bow and corners with a bright pink liner. Next, he brushed fuchsia lipstick on the outer edges and dabbed orange lipstick in a heart shape smack in the center. Of course you can re-create these looks using the lipsticks and lip glosses from Luxuria Cosmetics. Loved Rihanna’s makeup look at this years Grammy’s as much as us? Check out here how to re-create the look! The first thing to be aware of is to cleanse, exfoliate and hydrate your skin for the best results. 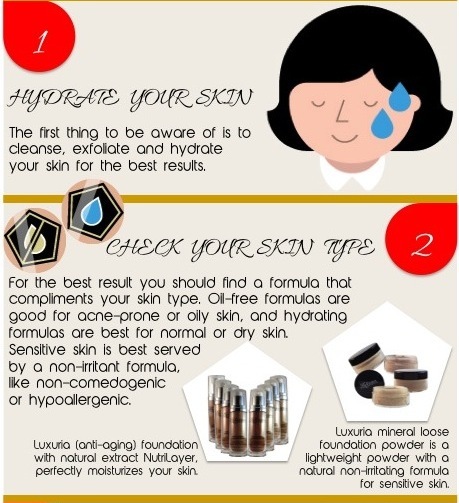 For the best result you should find a formula that compliments your skin type. Oil-free formulas are good for acne-prone or oily skin, and hydrating formulas are best for normal or dry skin. Sensitive skin is best served by a non-irritant formula, like non-comedogenic or hypoallergenic. When choosing a foundation color, compare it to your jawline tone. Find a color that would disappear in natural sunlight. It means it blends in completely with your skin. Be aware that your skin tone changes with the seasons. It can get lighter and darker and sometimes it changes with age. 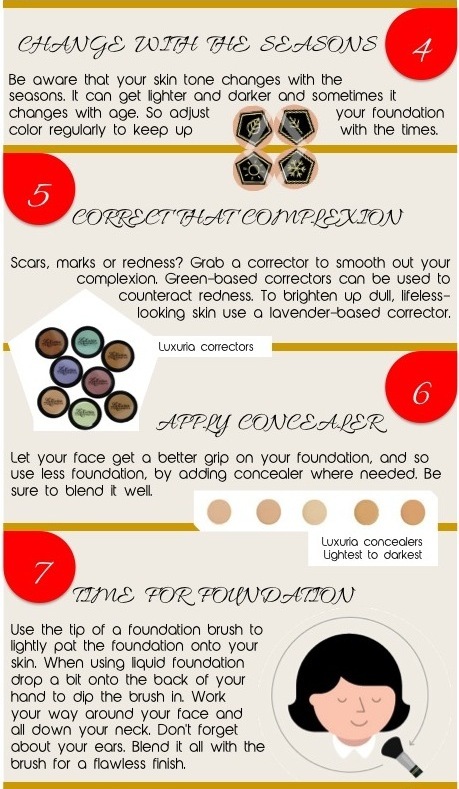 So adjust your foundation color regularly to keep up with the times. Scars, marks or redness? Grab a corrector to smooth out your complexion. Green-based correctors can be used to counteract redness. To brighten up dull, lifeless-looking skin use a lavender-based corrector. Let your face get a better grip on your foundation, and so use less foundation, by adding concealer where needed. Be sure to blend it well. Use the tip of a foundation brush to lightly pat the foundation onto your skin. When using liquid foundation drop a bit onto the back of your hand to dip the brush in. Work your way around your face and all down your neck. Don’t forget about your ears. Blend it all with the brush for a flawless finish. Define your face by adding a slightly darker powder where you wish to create shadows. Apply the powder using a smaller angled powder brush and sweep it along the hairline. Then continue around the curve of the cheekbone near the side of your face. Finish underneath the jawline. All these motions create the shape of the number 3. Blend it all together. Don’t worry about the season, bronzers can give you a beautiful glow any time. Use a larger bronzer or powder brush to sweep a small amount wherever the sun would hit naturally. So your forehead, around your cheekbones, down the center of your nose and along the sides of your face. Again, be sure to blend well. Finish of your look by adding some highlighter to soften lighting where you need it most. All you need it a small swipe down the center of your nose and along the top of the brow bone underneath the eyebrow for an instant lift. Blend well. 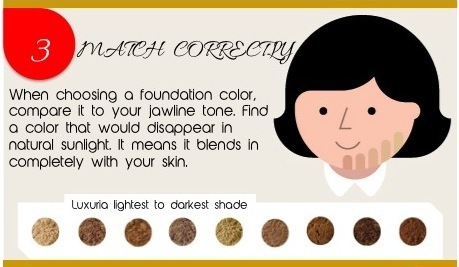 FOR MORE TIPS AND GET HELP CHOOSING YOUR SHADE, CLICK HERE. Hi beauties!!! Every girl has a handbag. These are our everyday handbag essentials. Hi beauties! This video is to remind us that Valentine’s day is not just for that special someone but for all those around you! The people, the animals and even nature. If you give out love on a daily basis you will be surprised at what you’ll receive! 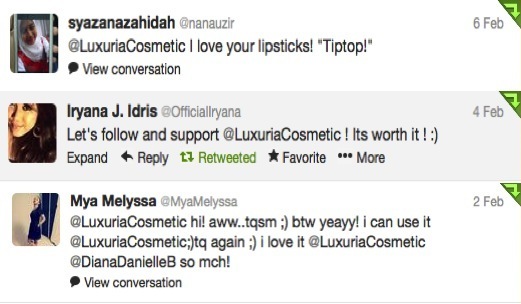 February 2013 marked the launch of Luxuria Cosmetics. It has been a busy first week and are overwelmed by the positive responses we have received. Thank you for supporting us and helping yourself get that Ethical Luxury. Our special of FREE SHIPPING WORLDWIDE will continue for a limited time only when you buy two items or more. Get that instant fix for blemishes, acne or redness. Be the most beautiful girl at the party. Feel confident at work. 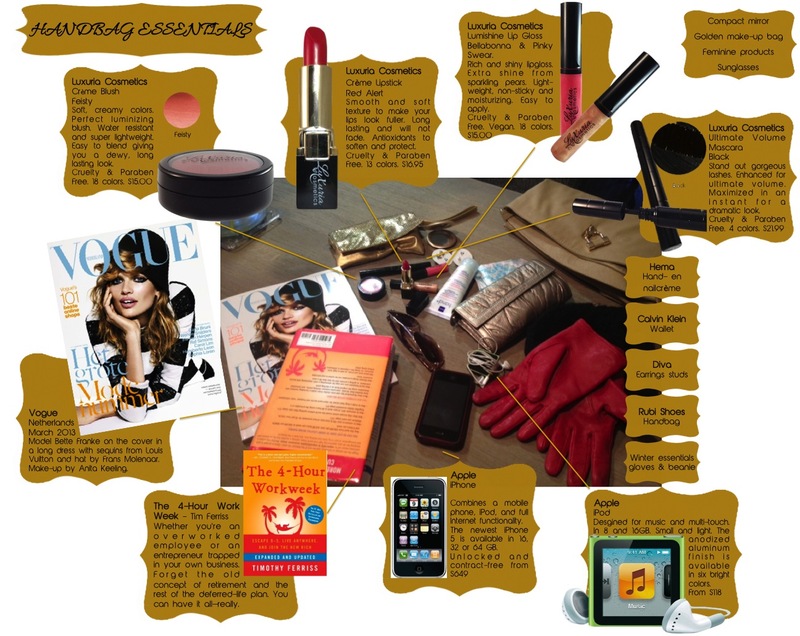 Get it all with Luxuria Cosmetics. Luxuria is proud to have received approval by PETA (People for the Ethical Treatment of Animals) for all of our products. This enforces our mission to abolish all animal testing, but testing for cosmetics in particular. If you have any thoughts on animal testing, welfare or the environment, please let us know. Check out our PETA listing. We have just added a review page to our website, this will allow all you amazing people, to be able to write a few short words about what you think about us or our products, do let us know! We would love to hear your thoughts! Speak your mind. Check out our blog post to see the looks and let us know which ones you would love to try out. Need help picking your shade? Don’t worry, we are here to help. We are most familiar with our products so we ask you to provide us with a current photo of your face in natural light without makeup on, so we can help you find your right shade for the product you desire. Please tell us what product you are interested in when sending us your photo. Submit a photo now. With our Mineral Eye Shadows (Gold Mine), Mineral Shimmer Powder (Fairy Dust) and a red shade from our Crème Lipstick range, you can create a beautiful look for that valentine date. 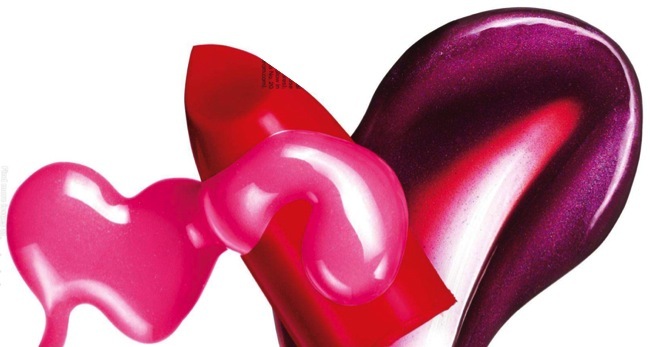 Make an even bigger impact by adding a nice Lip Gloss. Remember, if you buy any two items you get FREE SHIPPING. WORLDWIDE! Stay connected with us everyday- we are on Facebook, Twitter, Instagram and even Pinterest. Send us photos of yourselves with your Luxuria on because we would love to see how stunning you look! Tag us on Instagram (@luxuriacosmetics) or post it to us on Facebook or Twitter.